WHAT IS ALCHEMIA? Alchemia provides arts programming for adults with developmental disabilities who identify as artists or who are passionate about deepening their artistic, social, and communication skills through the expressive arts. Alchemia is committed to providing a physically, socially, and artistically nourishing environment where participants can develop and sustain strong interpersonal relationships, pursue individual creative goals, and explore their unique dreams. WHAT IS “CREATED EQUAL” ABOUT? 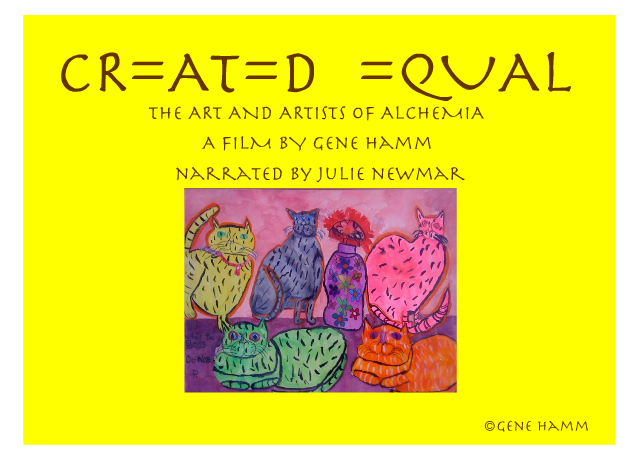 “Created Equal” will be a documentary about the artists of Alchemia, who display and sell their artwork at the A.W.O.L (Artists Without Labels) gallery in Petaluma, California. This film allows the artists to tell their own stories in their unique words and images. As their art is brought to life through animation, the audience will learn the inspiring stories of each Alchemia artist and what their creations mean to them. The film will also focus on the cycle of joy and positive emotions created when these artists show and sell their work to the public. The artists of Alchemia are the most optimistic and courageous people I have ever met, and it is a privilege to teach and create with them They are inspiring individuals who can show us all a great deal about what it means to live a passionate, purposeful life. When you meet them through the “Created Equal” film, you will understand and appreciate the joy of what it really means to be alive. WHAT DOES JULIE NEWMAR HAVE TO DO WITH THE PROJECT? Julie (Catwoman) Newmar has agreed to narrate “Created Equal”. I met her in the 1980”s at the Barnsdall Park Art Gallery in Los Angeles. Out of the corner of my eye, I spotted her sitting alone on the floor, leaning over her toddler. He was reaching up and playing with her long blonde hair. As I looked closer, I saw that her son had Downʼs Syndrome. Like many other fans, I had always been in love with Catwoman, and this scene touched my heart and has re- mained there all these years. I contacted her when I started the “Created Equal” project and sent her some of the work my students had created. She loved the films we have done in our Alchemia Animation class, such as “Parking” and “Trash Talk”. She was so enthusiastic about this project that she agreed to do the narration and I am so proud and honored to have her play a key role in this special film. WHERE WILL THE MONEY GO? $20,000 will get us good editing, some archival footage, animation, and music. It will also allow us to enter film festivals and promote the film to find a distributor. The goal is to finish the film by early Fall. If we get more than we ask for, we will be able to afford a higher quality production. If we get less, the film will still get made, but it may be a short instead of a feature. WHAT WILL YOU GET FOR YOUR DONATION? At different donation levels, donors will get perks such as a "thank you" in the film credits, “Created Equal Crew” T shirts, a DVD of the film, an Alchema artistʼs drawing of your car, a two-hour caricature session by the director of the film, photos of Catwoman autographed by Julie Newmar, and an associate producer credit in the film. TELL ME ABOUT THE FILMMAKER Gene Hamm, is an animation instructor at Academy of Art University San Francisco, CA, and animation and special effects instructor at Alchemia. He worked in Hollywood on such projects as Ralph Bakshiʼs Lord of the Rings, Hanna-Barberaʼs Smurfs and Superfriends, MTVʼs Liquid Television, Roger Cormanʼs Battle Beyond the Stars, and Art Clokeyʼs Gumby. His own projects include his feature The Dream Hat, the instructional video Cartooning Shortcuts, Formulas & Cheap Tricks. You can see more of his work on his YouTube Channel. HOW CAN YOU HELP? You could contribute money. Or you could tell everyone you know about “Created Equal” through Facebook, Twitter, Google Plus, Pinterest, email, phone calls, or just stick your head out the window and yell. We appreciate anything and everything you can do, and we thank you in advance for helping us show the students of Alchemia to the world! Currently the contributions are up to $1450.